Dave Thomas Foundation for Adoption-Canada partnership with the Ontario Ministry of Children, Community and Social Services leads the way in finding adoptive homes for children at greatest risk of aging out of foster care. Burlington, ON — Today, more than 30,000 children are waiting to be adopted from foster care in Canada. The hard reality is that too many children linger in care for years and age out of the foster care system without an adoptive family — putting them at an elevated risk of negative outcomes, including homelessness, unemployment, early parenting and substance abuse. The Dave Thomas Foundation for Adoption-Canada is partnering with the Ontario Ministry of Children, Community and Social Services to implement the Foundation’s evidence-based program to find adoptive homes for children who have been waiting in Canada’s foster care system the longest. Through its signature program, Wendy’s Wonderful Kids, the Dave Thomas Foundation for Adoption-Canada provides grants to adoption agencies to hire and train recruiters in the Foundation’s Child-Focused Recruitment Model. Wendy’s Wonderful Kids recruiters serve smaller caseloads to ensure they have the time and resources to give these children the attention they deserve while focusing on older youth, sibling groups and children with special needs. When a rigorous five-year evaluation of Wendy’s Wonderful Kids in the United States revealed that children served by the program are up to three times more likely to be adopted, the Foundation began scaling this program through a co-investment public/private partnership strategy. In 2016, the Dave Thomas Foundation for Adoption-Canada and the Ontario Ministry of Children, Community and Social Services officially launched a three-year commitment to scale Wendy’s Wonderful Kids in Ontario, with 15 adoption recruiters funded by the government and eight recruiters funded by the Foundation in coordination with Children’s Aid Societies across Ontario. Across Canada, 33 Wendy’s Wonderful Kids recruiters in Alberta, British Columbia, Manitoba, Newfoundland, New Brunswick, Nova Scotia, Saskatchewan and Ontario have found adoptive homes for 341 children, with another 103 in their pre-adoptive placements. Serenity and Kai of Ontario are two of those children. The siblings were adopted with the support of their Wendy’s Wonderful Kids recruiter, Darcy. “Darcy provided invaluable support throughout our journey to becoming parents to these amazing and beautiful children. We are eternally grateful,” said their mother, Kathryn. Darcy shared, “The model makes a difference as it is backed by the many supports provided by the Dave Thomas Foundation for Adoption-Canada to ensure that unadoptable is unacceptable.” Read and watch Serenity and Kai’s story. 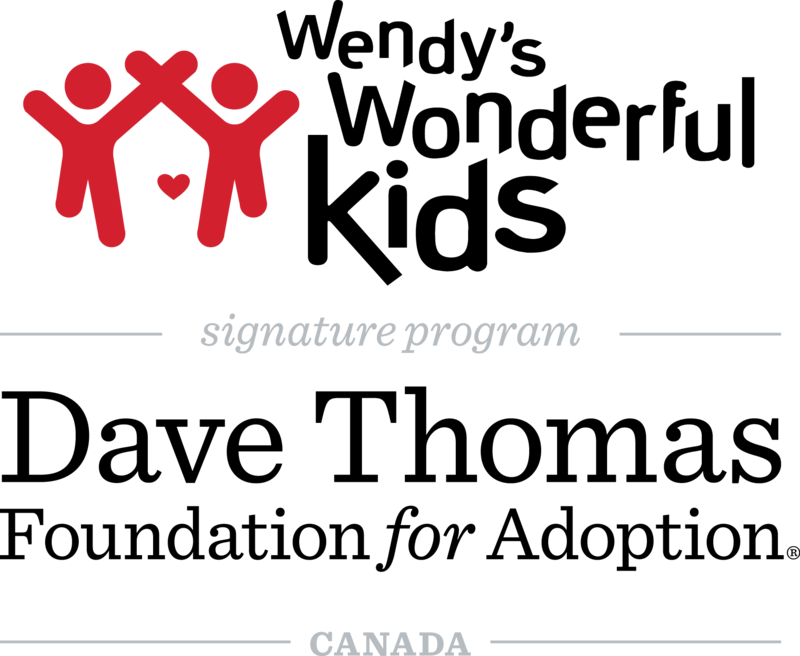 The Dave Thomas Foundation for Adoption-Canada is a nonprofit public charity dedicated exclusively to finding permanent homes for the more than 30,000 children waiting in Canada’s foster care system. Created by Wendy’s® founder Dave Thomas who was adopted, the Foundation implements evidence-based, results-driven national service programs, foster care adoption awareness campaigns and innovative grantmaking. Learn more at davethomasfoundation.ca or call 1-800-ASK-DTFA.